Our return to sprint kart racing has not been without it’s drama. 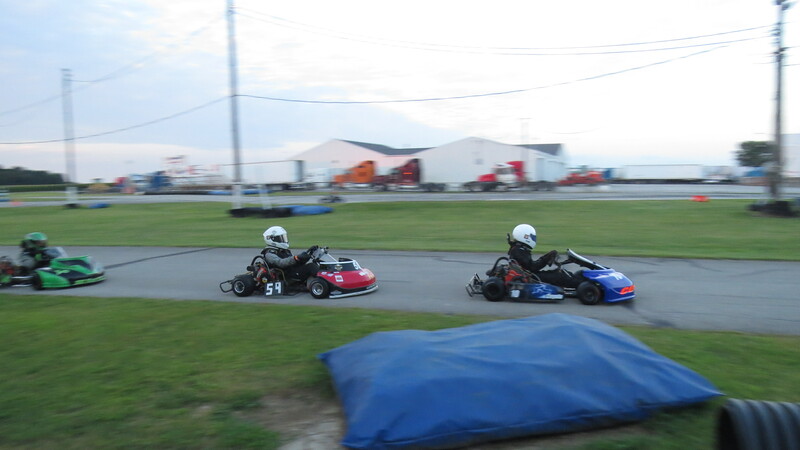 The weekend of racing at G&J Kartway was no exception. G&J Kartway is another of the vintage era tracks, like East Lancing Kart Track. It was built in the mid-50’s and is the birthplace of the World Karting Association one of the national kart sanctioning bodies. This is also a track that we have never visited previously and will test us. We have been struggling with ourselves as well as the kart. Both Jason and I have been discouraged with the lack of speed and have been nipping at each other while trying to work together. We both need to remember why we are doing this. It’s not for plastic trophies but for each other and the fun of it. There was hope we could get little practice in on Thursday night but we killed the spare motor during the 4th of july parade and the primary was sick and in Milwaukee. We did, however, have a plan and rented a motor from Tony Power to get us through the weekend. While this is not our preferred approach to racing but for the moment it seems the best option while we decide what to do about a new motor. Jason practiced all day Friday. Once he figured out the track basics we began tuning the kart. At the end of the day we had the kart pretty close and with some new tires on it would be ready for racing on Saturday. Saturdays practice started later than usual becuase the racing would be under the lights at night. It also started very badly with Jason going off in the first round then again putting it in to the bags in the second round. 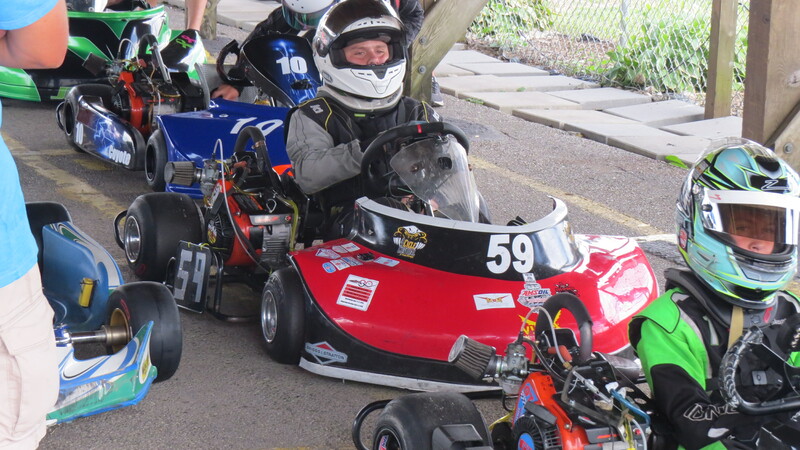 Finally, he got some laps in the third round, this really delayed us from adjusting the kart for the day. The practice tires seemed to have given up earlier then we expected. We put on new tires for qualifying but the left rear was flat and he qualified very poorly. The day continued to be extremely frustrating. In heat one he was not able to make up any spots and finished 7th, in heat two he picked up a single spot finishing 6th. At last it was dark and track was was lit up. The final frustration of the day, the clear visor was left at home and he had to race with a smoke visor. According to Jason, it was not too bad but after the race he said drove the track by feel and memory. The things you don’t want to know after a race. Despite the days troubles Jason finished 5th in the feature. Sunday we worked to regain our focus. At this point most of the work need to be done on the track. We did, however, make a gear change and Jason qualified 4th. In heat 1 finished 4th right with the pack. In heat two the Jason continued to run with the pack and finished 5th. We thought he could find a bit more speed and changed the gear back for the feature. A bad move, Jason was not able to keep up with the pack but still finished 5th. Despite all the weekends struggle, Jason declared that he wanted to go racing as we pulled out. I guess we had a pretty good time. The next race will be Championship Enduro Series Blackhawk Farms Race II. This is the begging of a three week stint of racing. We will be flipping from road racing to sprint racing and back. The days between weekends are going to be just as packed as the weekends as the karts are reset for each track. Thanks to Chris Cirillo from Tony Power for the use of the motor and advice over the weekend, if really made a difference.